Diamond tipped stylus for the cartridge Japan Crown, Denon Columbia DSN45, Sanyo STG 5 and 6, Toshiba resp. Nivico. In the 1980s this cartridge was e.g. used by the German Wurlitzer to replace the Philips GP213. This stylus Columbia DSN 45 replaces also the stylus in the ceramic cartridge Pfanstiehl P-132D very well. It improves the sound quality by creating a greater, more brilliant sound than the original needle Varco TN4. Check here to compare cartridges used by the Deutsche Wurlitzer company. 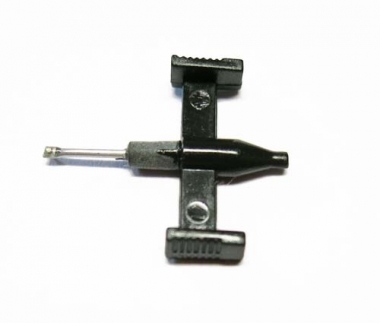 Notice: This stylus can be found as Nivico DT51, JVC DT51, Hitachi SJN45, Sanyo STG5, Sanyo STG6, and Toshiba N40C as well.